Been thinking of doing this for a while. No idea if it'd ever make it into baseline, but I would love a list of "definitive" versions of arcade game releases. The normal MAME parent set selection (English, final version) is good but there are arguments for alternative criteria (always first release in country of origin, etc), and I don't believe a single criteria fits all - far better to hand pick the better versions. I spent quite a while on this and have an amended gamelist somewhere. I considered it a personal taste thing, but I imagine most of us here would probably agree on similar. It became one of my annoyances with setting up mame. Uncluttered list vs Compete list vs Spending the time setting up the best of both. That's the thing. Mame suits unbiased consistancy so that's fine, but a hand picked AO dat file would be a nice option. Can I ask why pick that version of 3S over the Japanese version? I can't stand the "translated" versions of SF games. EDIT: Now with the CPS2 multicart in the horizon, maybe it is time for a proper translation of SSF2X? I got to the last few entries in the starting point and then realised I should be providing evidence for the choice, I'll go back and do URLs for more games at another time. TheRedKnight wrote: Can I ask why pick that version of 3S over the Japanese version? I can't stand the "translated" versions of SF games. Personal preference, I'll pick an English version if there's no technical reason to choose otherwise. I couldn't find anyone giving a reason that the English was different to play to the Japanese, whereas it's easy to find documentation on the revision differences. If there's a particularly irritating sound sample (Cosmo Gang the Video springs to mind), maybe the other one needs selecting. Reminds me, ssf2xj needs adding. Is there a difference in game/audio etc or is it merely the text? Street Fighter 2X I believe I added in addition to Turbo. This is one of the dawning factors of me realising that I'm never going to be happy. With some games it's nice to have a variation box set. ...Actually a frontend script that jumps you to the same position on the full list at the press of a button would make do as a boxset function. It would miss games with completely different region names though. Speaking of names. The first native release being the parent does make sense. Though a strong argument against it is 'Puck Man'. Origin release is Haze's preference from the looks of it, it's a saner one than the current simply in straightforward software development terms. Makes quite a lot of games broken though. The Japanese version of Robocop 2 has an intro level not found in the other builds. And it's actually a quite nice game. cools wrote: Is there a difference in game/audio etc or is it merely the text? I'm not a fan of 3S so I don't know. BUT from my experience the translation on every SF game has been atrocious. For example in SSF2X the win quotes are opponent specific, but not in ST. In the Zero series Gouki speaks, but in Alpha he just goes ".................." so you could say that they are two different characters, if the gameplay element is not taken into account. Those are just the two harshest examples. Also, the whole Sheng Long thing. I know most people don't really care but Capcom USA and SNK USA basically raped the story elements of the games. My personal preference is that I'd rather see Japanese I can't understand than bad grammar and stupidity. Robocop 2 is an interesting one, the Japan is a later revision to the export. TheRedKnight wrote: BUT from my experience the translation on every SF game has been atrocious. For example in SSF2X the win quotes are opponent specific, but not in ST. In the Zero series Gouki speaks, but in Alpha he just goes ".................." so you could say that they are two different characters, if the gameplay element is not taken into account. Those are just the two harshest examples. Also, the whole Sheng Long thing. Community translation time ...has this not been started already? It would nicely complement a CPS2 flash cart. Now where's that Camdic app? The only reason why I decided to get the multicart is just to possibly be able to play a proper translation of SSF2X and other SF games in the future. For Donkey Kong I prefer the US version for it's level sequence. Plus it makes me feel like I'm Billy Mitchel. Reading The Cutting Room Floor always helps me fall asleep. Golden Tee 2000 Tournament     gt2k (regular)   gt2kt500      Tourney edition, changes? Playing a hack of KOF2002? Really? No. Just no. 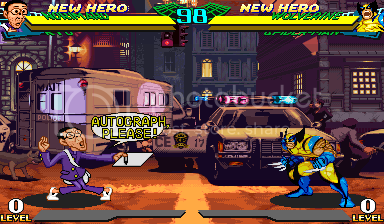 And isn't it Marvel Super Heroes VS Street Fighter where the JP version has an extra character (Norimaru) and not Marvel VS Capcom? That's a great help, thanks dgame. TheRedKnight wrote: I'm not a fan of 3S so I don't know. 3rd Strike seems to have escaped being terrible, albeit I've not hammered it a lot - I've checked the basics out and it looks like a straightforward translation. I am tempted to select the USA version rather than the Euro though - from what I gather it's the one that was used for 3rd Strike Online. English stays though unless there's a clear reason for Japanese - the supers/service menu are translated for one. The Japanese version of Rygar, Argus No Senshi (first revision?) has better scoring possibilities in a way (more stars) and a hidden 1UP on stage 14. The English version has more "?" powerups (it can be turned into all sorts of items when hit). The old Japanese rom has a few bugs though, but they are just charming unless you're an operator.